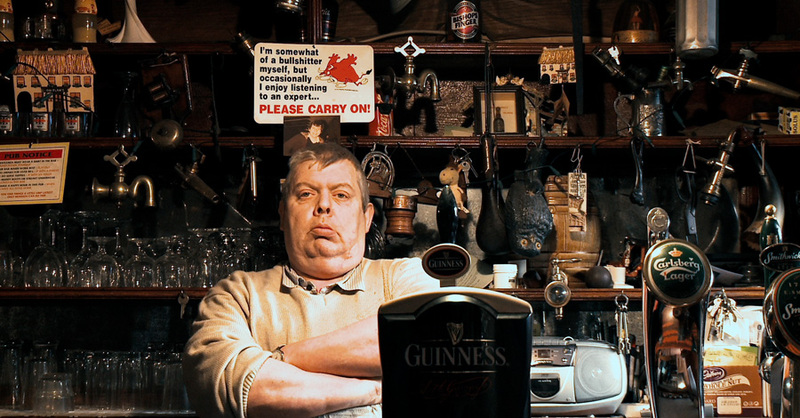 I know little about this documentary, called “The Irish Pub“, other than it’s to be released in the US in October. But, knowing how the pub trade is changing in Ireland, I fear it’ll be something of an elegy to the pubs of old. If you aren’t aware, the traditional pubs are closing, being replaced by modern pubs with trendy decor and flat-screen televisions. There are still traditional pubs out there, but you often have to know when to go so there’ll be some craic and a few others present. Anyway, check out the trailer, and keep an eye on their website or Facebook page to learn if “The Irish Pub” is coming to a theater near you. Brilliant to see the video again! Only shared this Facebook post yesterday because it looks great. It’s a pity however that Ireland continues to be portrayed in its old quaint image it used to have to attract people from abroad (deliberately by the tourist board). Many people I know were rather disappointed when they first arrived in Ireland and found the large, fancy pubs where you can’t enter if you’re wearing trainers so to speak. I myself was a bit disappointed with Dublin the first time I visited Ireland, simply because travel programs abroad portrayed it as this tiny city where you could find pubs left, right and centre with live music being played in every single one of them. What I found though was er… urgh… U2 songs blaring from them (sorry, just not my cup of tea anymore :)) and the same clothes shops as I had in my own country. Just another European capital so. Can’t wait to see this! These pubs still exist in County Clare and maybe with the Celtic Tiger years over these pubs that still remain won’t be wiped off the map. Looking forward to seeing this – maybe it will help save a few. It’s so hard to see them disappearing – a loss of much more then a good pint. Sadly, I know at least one of the pubs in the documentary has closed recently.